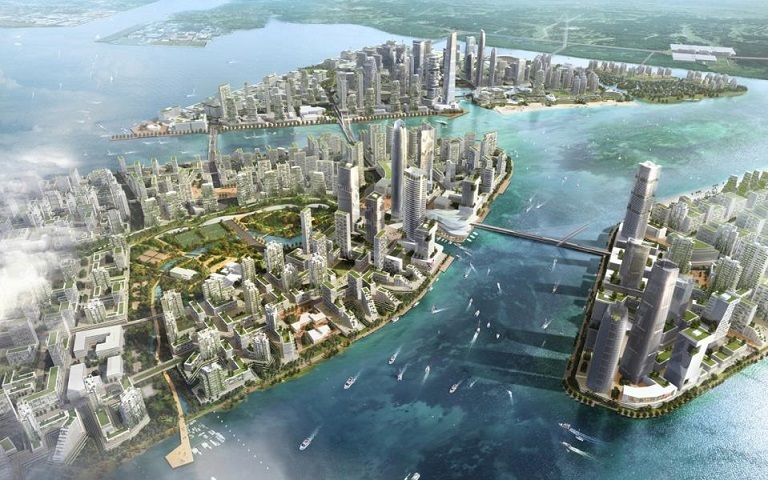 The multi-billion ringgit Forest City development, taking shape on reclaimed land off the southern coast of Malaysia and close to Singapore, has generated plenty of international attention – but not all of it good. The RM169.26 billion futuristic “eco-city” promises a vibrant landscape of high-rises and luxury waterfront villas spread out on four man-made islands. It offers over 700,000 residential units, shopping malls, hotels, medical facilities and even its own immigration centre on 3,425 acres. While all this has enticed a slew of international property investors, which promises to give the local economy a tremendous boost, the development’s location within the Johor Strait has raised serious questions about its environmental impact – particularly to the surrounding ecology and the subsequent effect it will have on the local community of fishermen. A rising chorus of environmental activists are now saying that the mammoth development could prove to be a disaster for the local ecology and fishing community, who already complain about their rapidly disappearing livelihood. An official environmental study undertaken by the Forest City joint-venture firm, Country Garden Pacificview Sdn Bhd, acknowledges that there will be a “permanent loss of traditional fishing ground” due to likely damage to seagrass meadows and mangroves. However, the project’s protagonists argue the loss will be balanced by the immense economic benefits, including an estimated creation of more than 62,000 jobs. The company has also reiterated that the development has strictly followed the guidelines laid down by the Malaysian government to minimise the environmental impact. Despite this, the local fishing community isn’t the only concerned party raising red flags about Forest City, and it has found an unlikely ally in across the Causeway. The development has also alarmed Singapore, which has expressed its concern about Forest City’s proximity to the sovereign island’s border and the spillover environmental impact it will have on its shores. Singapore’s environmental ministry has said that it is carefully studying the impact assessment report provided by the Malaysian government and that it is currently seeking further clarification on a number of matters. Country Garden Pacificview executive director Mohamad Othman Yusof said that “no damage or pollution has been exported to Singapore” and water quality is monitored closely following complaints by Malaysian fishermen. “We don’t want to create any problems with anybody, and we’re going to abide by the rules and regulations. We are very confident about the success of the islands,” said Othman.